Heather Erickson is a consulting ecosystem ecologist and occasional Adjunct professor in the greater Portland metro area. 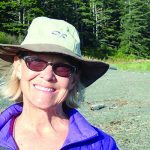 A Northwest native, she has a strong connection with Northwest landscapes, and has worked in the Gifford Pinchot National Forest and other regional forests on and off for over 30 years. Her research addresses interactions between land-use change (forest management), climate, and biogeochemical cycling. In addition to local coniferous forests and streamside ecosystems, she has worked in boreal wetlands, mixed-conifer forests in the Sierra Nevada Mountains, and wet and dry forests on tropical islands in the Caribbean.